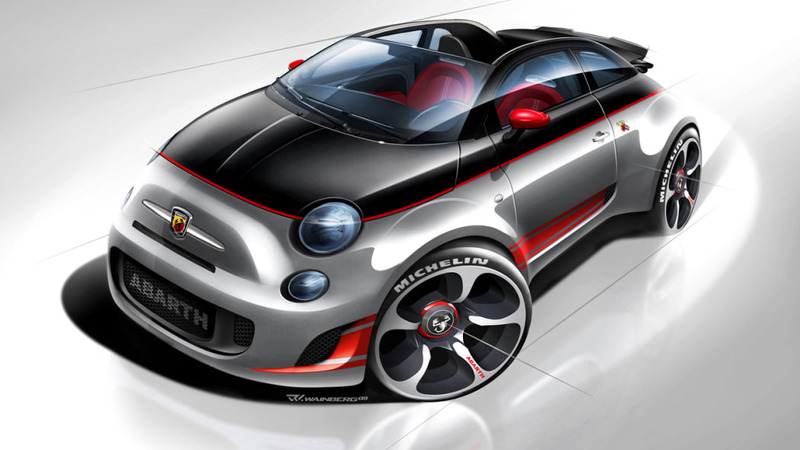 The 2013 Fiat 500C Abarth is debuting in the City of Angels. It's the super-tuned version of the 500C combining all the best of fresh-air motoring and heightened performance from the scorpion-badged marque. As with the vanilla 500C, the Abarth's folding canvas roof opens all the way at up to 50 miles per hour, and will slide back to the rear spoiler at up to 60 mph. 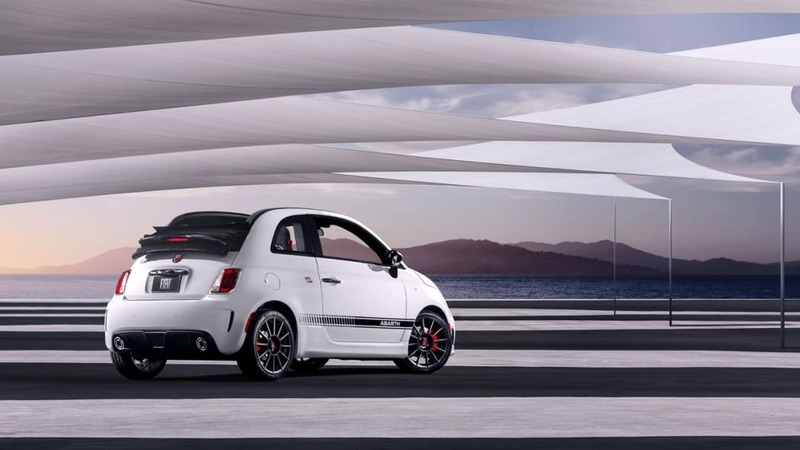 Sweetening is found everywhere else, with Fiat's 1.4-liter MultiAir good for 160 horsepower and 170 pound-feet of torque in Sport mode (155 lb-ft standard), which takes the baby hatch from standstill to 60 miles per hour in just over seven seconds. 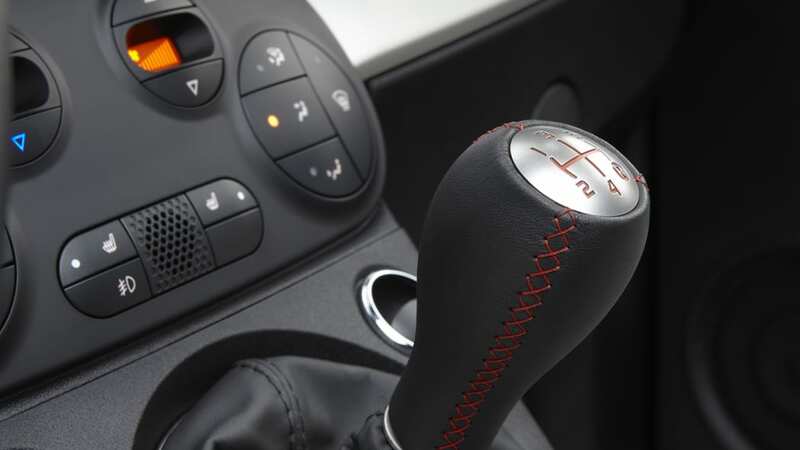 Shifting is via a five-speed manual, but the sound of that engine running straight from the dual exhaust pipes to your ears with no roof to intervene should help you forget about the anachronistic transmission. 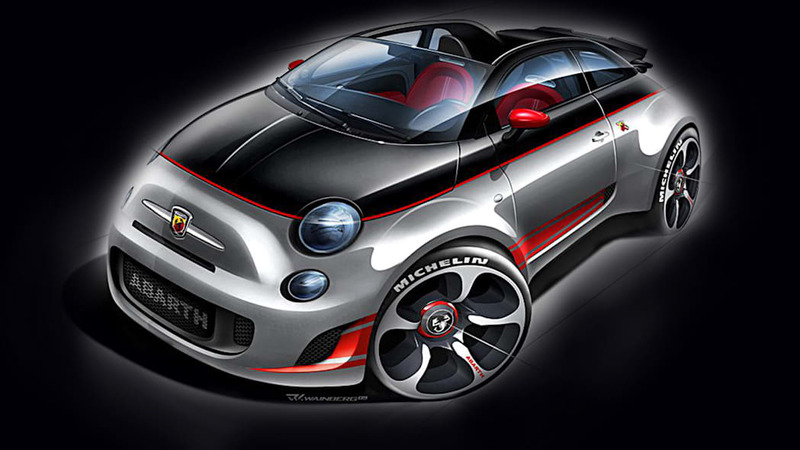 Underneath its skimpy bits of metal, the Abarth gets tons of tweaks compared to the 500C to support its sporting nature. Things like a reworked suspension with stiffer springs, larger half shafts and CV joints, quicker steering and larger brake rotors, a three-setting ESC and optional 17-inch alloys all add to the fun. The cabin throws plenty of black leather around, along with one-piece seats that get racing harness pass-throughs. 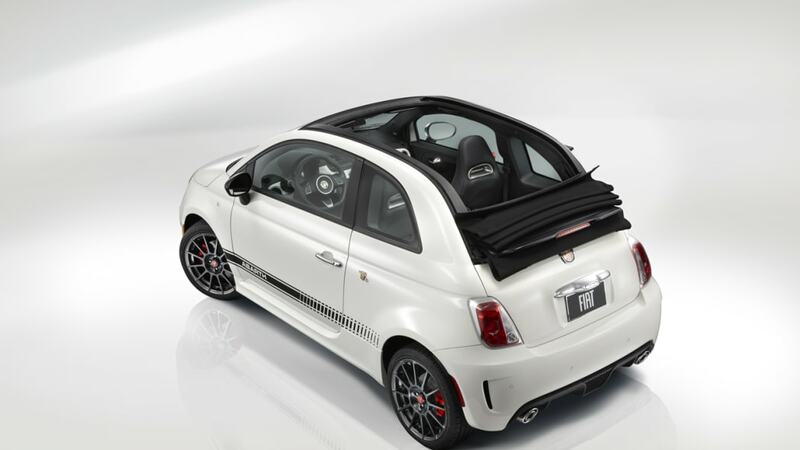 If the engine note isn't enough to satisfy your aural requests, the 500C Abarth is the first convertible in the world to get a Beats by Dr. Dre audio system, boasting six speakers and a subwoofer. Buyers can also take advantage of the Abarth Driving Experience free of charge, taught by instructors at – of all things – the Richard Petty Driving Experience. Sit tight, we'll have live pictures of the new performance ragtop live from the 2012 LA Motor Show for you shortly. The Fiat 500 Abarth brought world-class performance and precision, purposeful and aggressive styling, high power-to-weight ratio and limited-production volume to North American driving enthusiasts in 2012. 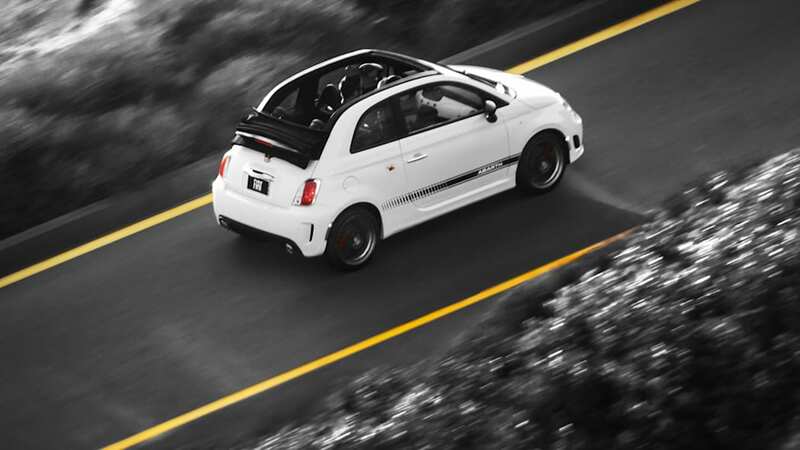 Adding even more excitement to Karl Abarth's line of "small but wicked" cars, the new 2013 Fiat 500 Cabrio (500c) Abarth harks back to his open-air track cars of the 1960s, while delivering the most visceral experience of any modern Cinquecento to date. 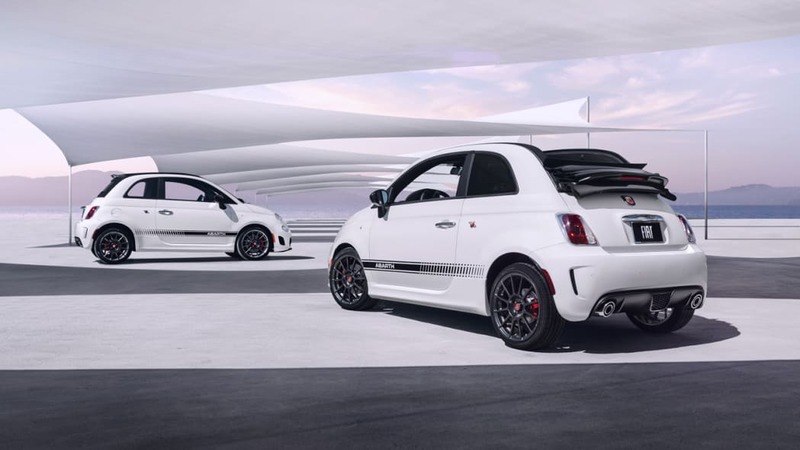 "The new Fiat 500c Abarth delivers the wicked attitude and track-proven capabilities of the hatchback model, now with the rush of open-air Italian performance," said Tim Kuniskis, Head of FIAT Brand for North America - Chrysler Group LLC. "And with the push of a button our new turbocharged cabrio can unleash that added sense of freedom, while offering one of the most respected soundtracks of all-time, the rasp from its signature Abarth-tuned dual exhausts." With the Fiat 500 Abarth's high-performance DNA intact, the new 2013 Fiat 500c Abarth is engineered with the same track-proven attributes that have made the hatchback model a success on European and North American roadways and racetracks, but now brings even more fresh air and the unmistakable Abarth-tuned exhaust note into the cabin. 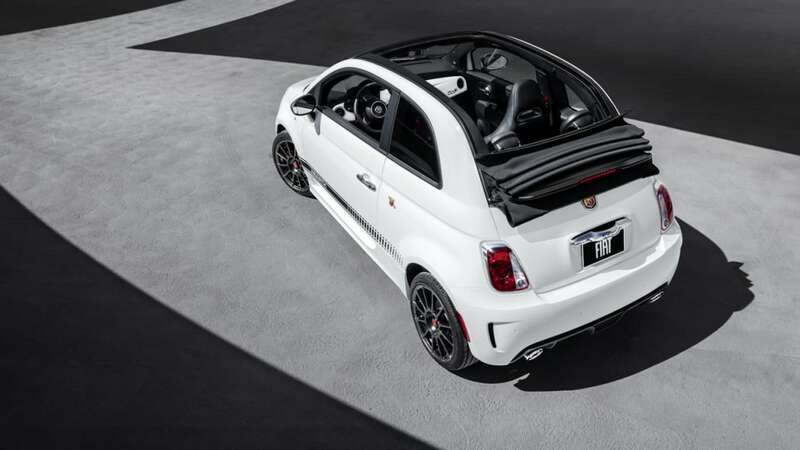 With just the push of a button, the Fiat 500c Abarth's power-operated cloth top retracts up to the rear spoiler during speeds up to a best-in-class 60 mph (a midway point can be chosen by pressing the button anytime in between). Press the roof button again, and the roof will neatly fold all the way open and tuck neatly behind the rear head restraints (up to 50 mph). The power operated cloth top is also intelligently designed. For access to the Fiat 500c Abarth's trunk, premium "parallelogram" liftgate hinges conveniently position the liftgate out of the way, while the power-operated cloth top automatically retracts back to the rear-spoiler position to avoid any obstruction. In addition to its cleverly designed multi-position power-retractable cloth top, the Fiat 500c Abarth's fully stamped body-side silhouette retains the iconic Cinquecento form while delivering added structural strength and 70 percent less header shake than key competitors. In addition, its longer windshield and minimized header design maximize rear-seated passengers' outward visibility, while minimizing cabin turbulence. In the late 1950s, Karl Abarth believed that race cars with brilliant performance could be derived from small, lightweight, everyday driving cars - including the original Cinquecento (500). 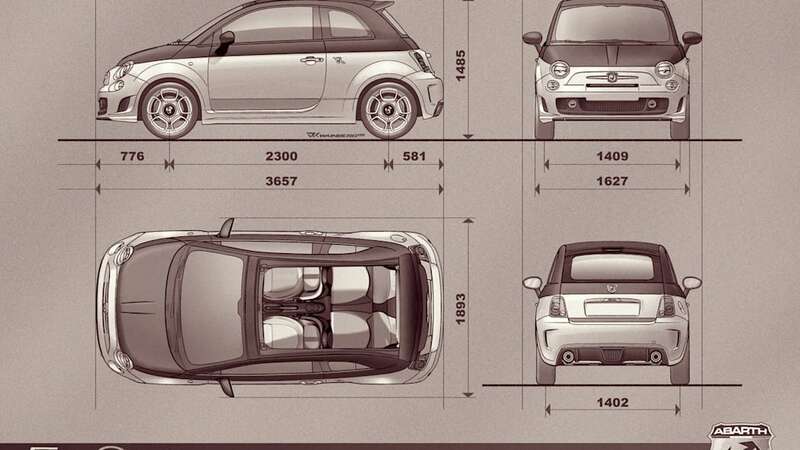 And his tradition of track-ready small cars continues today by utilizing the high-performance 2013 Fiat 500 Abarth as a base point for the new cloth-top Fiat 500c Abarth. 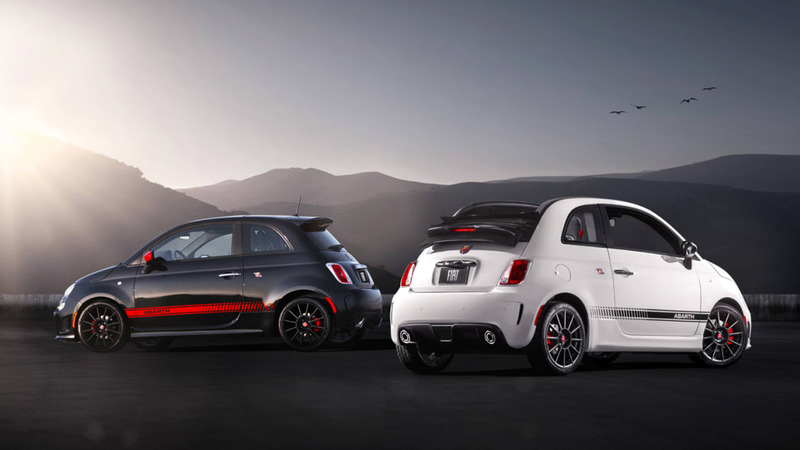 Like the Fiat 500 Abarth, the new 2013 Fiat 500c Abarth features the track-proven 1.4-liter MultiAir Turbo engine for 160 horsepower, up to 170 ft.-lb. of torque and 0-to-60 mph performance in the low 7 second range. Compared with the Fiat 500c's naturally aspirated 1.4-liter MultiAir engine, the boost to 160 horsepower on the Fiat 500c Abarth is largely due to its single turbocharger that operates off engine exhaust and utilizes energy that would normally be wasted through the tailpipe. The turbocharger spins up to 230,000 rpm to convert exhaust heat and pressure to a rotational force that drives a compressor. The compressor draws cool air and pumps it into the intake manifold at increased pressure (maximum 18 psi / 1.24 bar) that results in a greater amount of air in the cylinder and, hence, more power. The 1.4-liter MultiAir Turbo's induction system includes two intercoolers located behind the driver- and passenger-side air inlets of the Abarth-styled front fascia. The intercoolers are designed to remove heat in the air charge that the turbocharger generates while compressing incoming air (higher air density for more power). Reducing heat provides a cooler, denser air charge that helps increase the potential for more power. 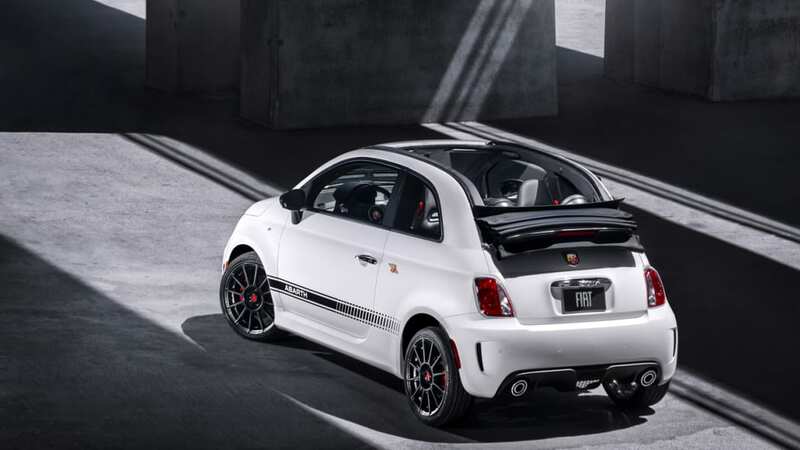 Other high-performance engine component upgrades include an Abarth-designed fresh-air intake system with high-flow air filter and smooth-flowing plumbing for maximum power. And to make sure the engine is operating with minimal exhaust gas restriction, an Abarth-designed concentric "double-tip" dual-exhaust system delivers a high-performance look with menacing Abarth-tuned sound. Developed for high-output applications, the Fiat 500c Abarth is equipped with the track-proven C510 five-speed manual transmission. Proven on the European 500 Abarth models, this transmission features a 3.35 final-drive ratio for quick acceleration and faster top speed, while maintaining fuel efficiency. Designed to handle the increased torque loads, the Fiat 500c Abarth's C510 transmission includes an intermediate shaft with equal-length half shafts to mitigate torque steer. 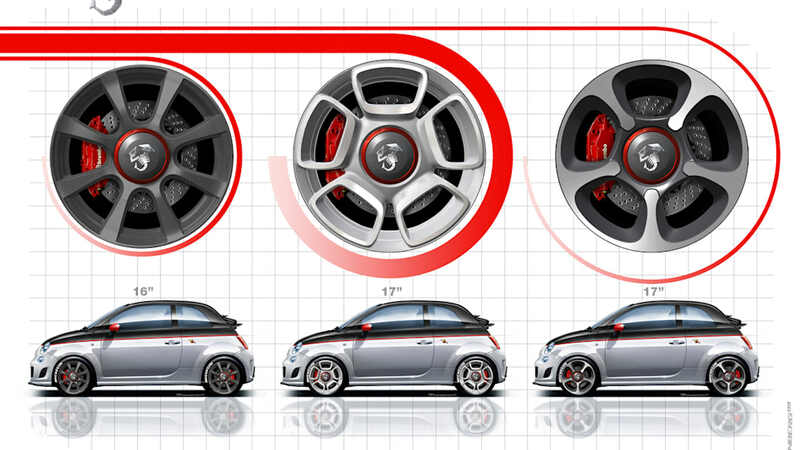 Compared with the Fiat 500c, the 500c Abarth features 23 percent larger half shafts (28.1 mm diameter vs. 22.8 mm diameter in the Fiat 500c) for increased strength and to reduce torsional stress in the driveline during performance driving on the road or track. To handle the increased power and torque of the 1.4-liter MultiAir Turbo engine, larger constant velocity (CV) joints with 53 percent greater torsional strength (2,600 N•m vs. 1,700 N•m in the Fiat 500) deliver added durability and refinement. For more than fun under the sun, the new 2013 Fiat 500c Abarth is designed, engineered and tested to deliver the high-performance driving and enduring capabilities needed for track use. 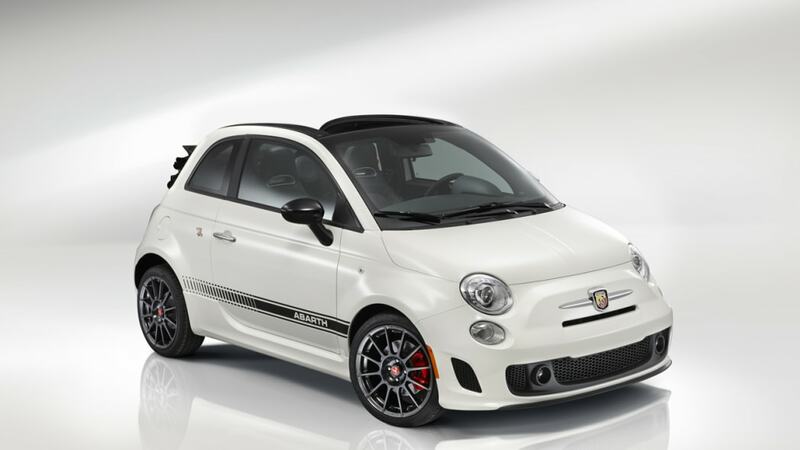 Like the hatchback, the new 2013 Fiat 500c Abarth features an enhanced front- and rear-suspension design to deliver the precision handling, steering and refinement needed for high-performance driving. Compared to the Fiat 500c, the Fiat 500c Abarth features a unique MacPherson suspension design with 33 percent stiffer front spring rates and 0.6-inch (15 mm) lower ride height (compared to the Fiat 500c) for improved handling and minimal body roll. Abarth-designed cast-iron front lower control arms provide improved lateral stiffness, while an increase in negative camber to -1.5 degrees delivers improved grip and steering precision. In addition, dual-valve frequency selective damping (FSD) KONI twin-tube struts deliver road control and maximum grip, while actively filtering out high-frequency suspension inputs from uneven road surfaces to adjust for comfort and smoothness. The beefier rear-suspension design of the Fiat 500c Abarth takes the Fiat 500c model's (already 300 percent stiffer than the European Fiat 500) twist-beam design further, with a torsionally rigid rear axle designed with strengthened coil-spring supports for greater durability. 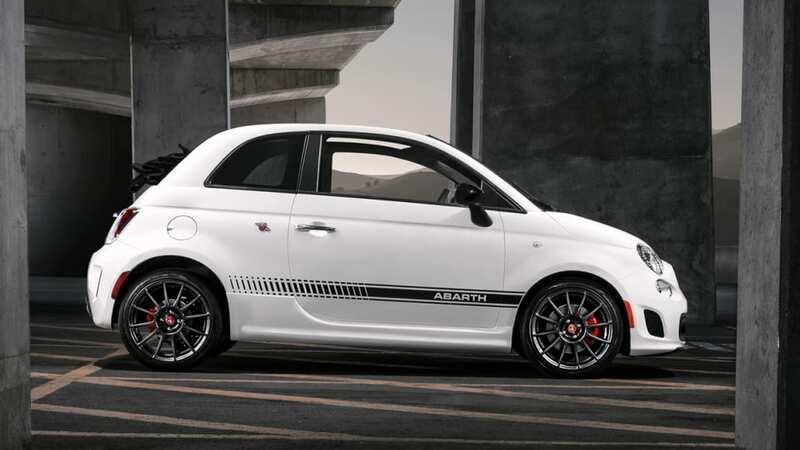 A 0.87-inch (22 mm) Abarth-specific solid rear stabilizer bar increases cornering grip. For improved handling, minimal body roll and ride-height control (when fully loaded), the new Fiat 500c Abarth features 12 percent stiffer rear springs with 0.6-inch (15 mm) lower ride. For 10 percent quicker steering to enhance responsiveness, maneuverability and high-performance feel, the Fiat 500c Abarth features a 15.1:1 (up from the Fiat 500c's 16.3:1) steering-gear ratio. Compared to the Fiat 500c, the 500c Abarth features a uniquely tuned electronic power steering (EPS) calibration for increased steering response and feedback. In addition, the Fiat 500c Abarth features a road crown and cross wind compensation algorithm, which automatically compensates for temporary situations where there is a constant push of the car to one side or another, assisting the driver against driving during such conditions. 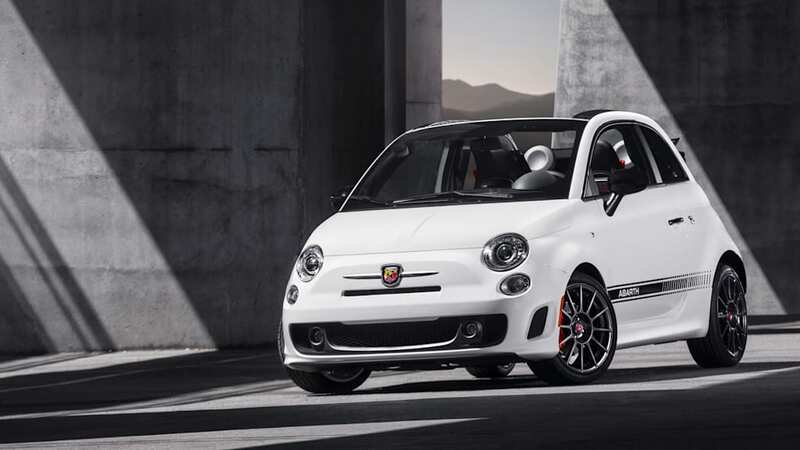 The Fiat 500c Abarth features a high-performance brake system with semi-metallic brake linings at all four corners, and larger 11.1-inch ventilated rotors for greater stopping power (up from 10.1-inch). Both front and rear brake calipers are lacquered in Rosso (red) paint for an athletic look. 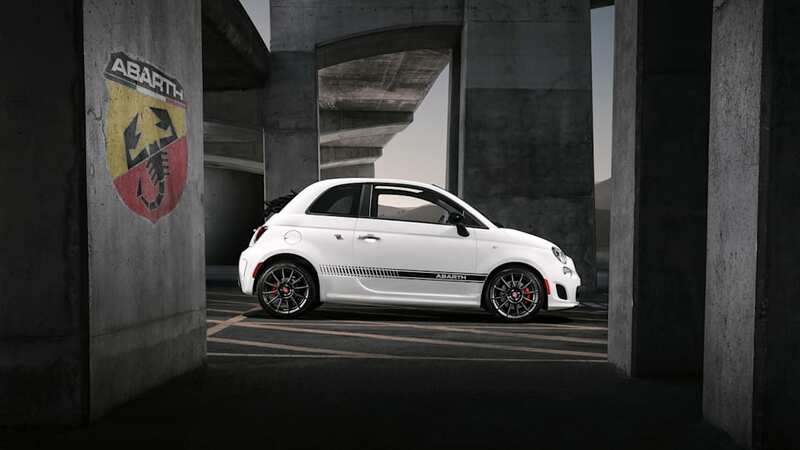 An Abarth-tuned electronic stability control system (ESC) features a three-mode calibration to maximize the Fiat 500c Abarth's handling capabilities on and off the track. When ESC is selected from "On" to "Partial Off" or "Full Off" on the instrument panel, the 500c Abarth's innovative torque transfer control (TTC) system maximizes throttle performance during on-throttle cornering. Standard on the Fiat 500c Abarth are 16 x 6.5-inch cast-aluminum wheels with 195/45 R16 Pirelli Cinturato P7 tires that deliver all-season traction and low-noise characteristics. For even more performance, larger and wider 17 x 7-inch forged-aluminum wheels keep this Cinquecento lightweight at each corner and feature high-performance three-season Pirelli P-Zero Nero tires with a 205/40 R17 size for a wider stance and reduced profile for improved handling. The aggressive styling of the Fiat 500c Abarth embodies the Abarth brand tradition in full - purposeful and intentional details all designed to improve the car's performance, while enhancing the clean and simple design language of the Cinquecento. To improve aerodynamics and the necessary engine compartment space for the 1.4-liter MultiAir Turbo engine, the Fiat 500c Abarth's features a more pronounced front fascia. 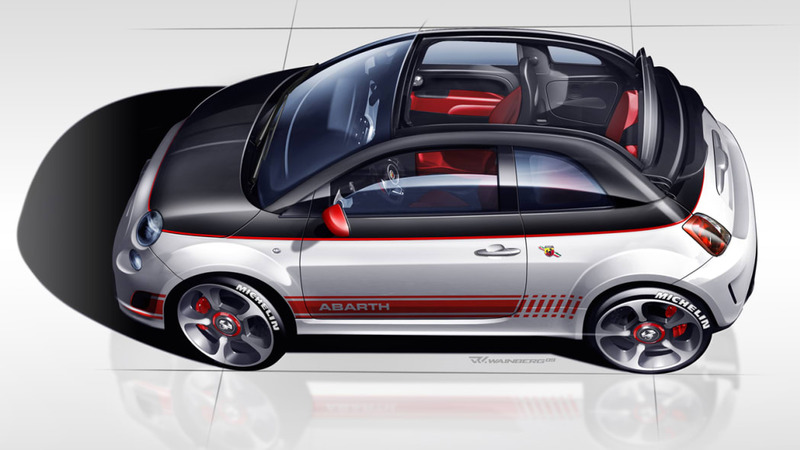 For additional air intake, the signature "Abarth" shield floats on a finned surface and a larger intake below consists of three inlets with broader openings than the Fiat 500c. For a more aggressive look, twin "nostrils" are precisely positioned on the front fascia to maximize airflow in and out of the two engine intercoolers (both intercoolers are visible through the "nostril" inlets). Abarth-designed side skirts give the Fiat 500c Abarth an athletic profile, while 16-inch or optional 17-inch lightweight forged-aluminum wheels fill the flared wheel arches and provide ventilation for the performance brake system. From the rear, an Abarth-designed cloth-top-mounted spoiler extends the roofline and improves the vehicle's aerodynamic behavior by creating additional downforce. Below, the two-piece Abarth-styled rear fascia accentuates the road-holding stance and optimizes airflow output with its rear diffuser. 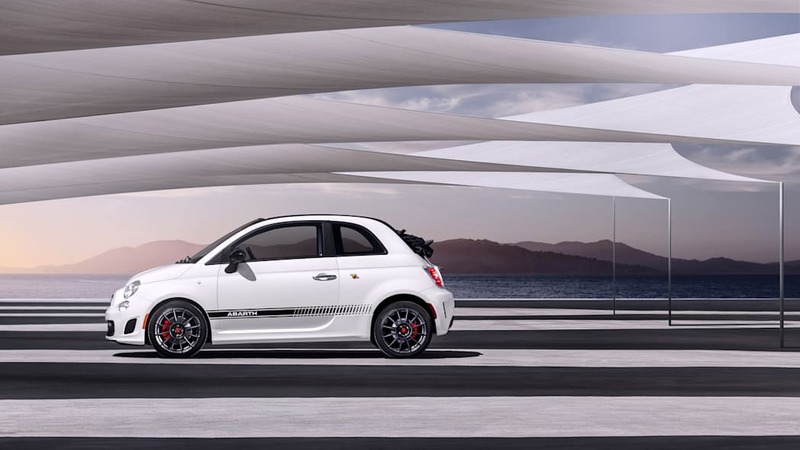 In addition large concentric "double-tip" exhausts provide an exclusive Abarth-tuned sound and look. 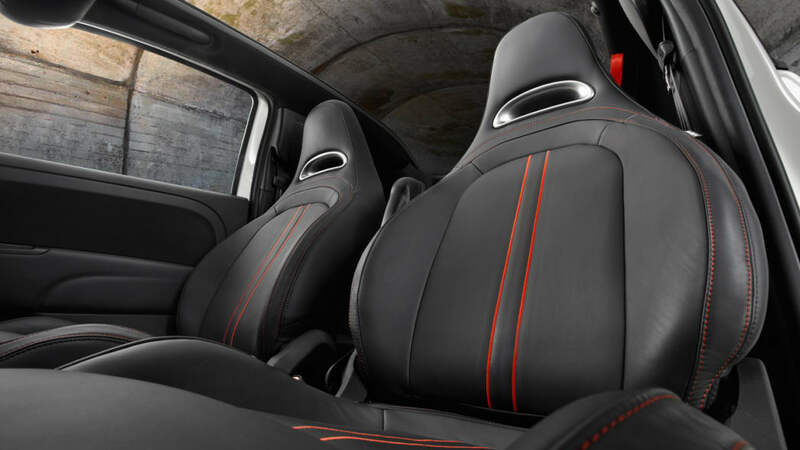 The interior design theme of the 2013 Fiat 500c Abarth is an artistic blend of clean lines and functional performance appointments. An Abarth-designed steering wheel features a thick rim, perforated leather and flat bottom to provide the look, feel and increased roominess desired during at-the-limit driving. A large concentric instrument cluster with 160-mph speedometer, tachometer and trip computer sits behind the steering wheel, and features a leather-wrapped cluster brow wrapped in Nero (black) leather with Rosso (red) accent stitching. To the left, an analog turbo-boost gauge with integrated LED shift light in the center that illuminates to an instant before redline to optimize gear changes. Below the instrument panel, Abarth-designed aluminum pedal covers feature Nero rubber trim for a decidedly racing look, while the Nero leather shift knob with Rosso accent stitching provides a precise feel of the shifter. 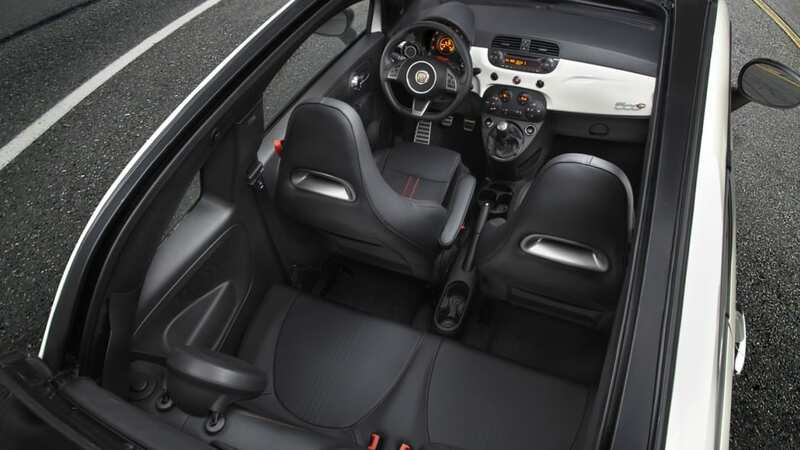 Unique Abarth-styled front performance seats feature a one-piece design with large side bolsters, a racing-harness pass through, accent stitching around the perimeter and integrated side-thorax air bags. To highlight that this cabrio has the most interior space, rear-seat legroom and shoulder room among key competitors – the rear passengers' upper seatbacks are raised and bolstered for added back support. New for 2013, the segment-exclusive-and first-time-ever-in-a-cabrio integration of Beats by Dr. Dre audio system offers passengers of the Fiat 500c Abarth a high-definition music experience the way the artist intended. The Beats Audio studio-quality sound system includes six premium speakers, an 8-inch dual-voice coil (DVC) subwoofer with trunk-mounted enclosure and eight-channel amplifier with Beats Audio digital sound processing (DSP) algorithm. 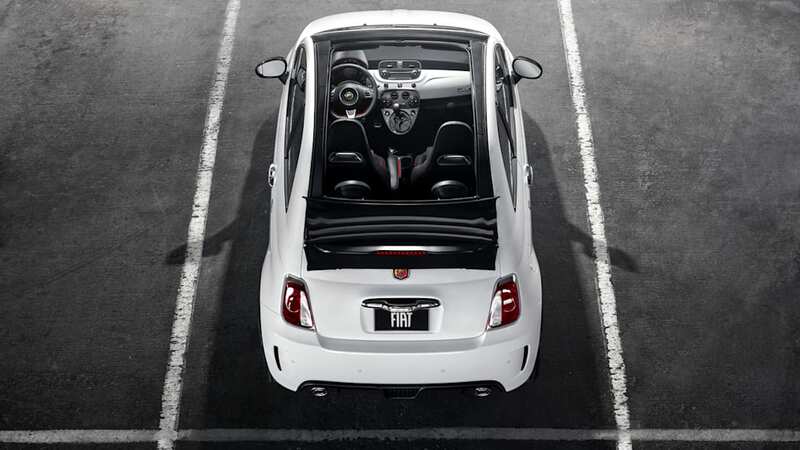 The Fiat 500c Abarth features a standard-equipped "Sport" mode calibration for more engaging driving. Should the driver select Sport mode on the instrument panel, the Abarth-tuned PCM unleashes the full power of the 1.4-liter MultiAir Turbo (torque increases from 150 ft.-lb. to 170 ft.-lb.) with linear throttle response and a more performance-weighted steering feel. When Sport mode is not engaged, the Cabrio returns to "Normal" mode and limits the torque in first and second gears to enhance fuel efficiency and minimize CO2 emissions. An additional benefit of the Abarth-tuned PCM is the driver's shift light with turbo-boost gauge mounted left of the instrument cluster. Should the driver choose to switch to "Sport" mode, the Fiat 500c Abarth's LED-illuminated shift light flashes as the engine speed approaches the redline - giving the immediate feedback needed on the track or during high-performance driving. BLUE&ME Handsfree Communication technology is an in-vehicle, voice-activated communication system that allows the Fiat 500c Abarth driver to operate a Bluetooth-compatible phone while keeping his or her hands on the wheel and eyes on the road. Using a series of voice commands, the driver can place phone calls and access the phone's address book. BLUE&ME Handsfree Communication technology supports most mobile phones with Bluetooth technology. With the available TomTom navigation with BLUE&ME Handsfree Communication technology, the Fiat 500c Abarth integrates an innovative 4.3-inch (10.9 cm) TomTom portable navigation device that docks on top of the instrument panel. With its large touchscreen, simple map displays with available real-time traffic, weather and points of interest, TomTom Navigation with BLUE&ME Handsfree Communication technology is intuitive for the driver to use. 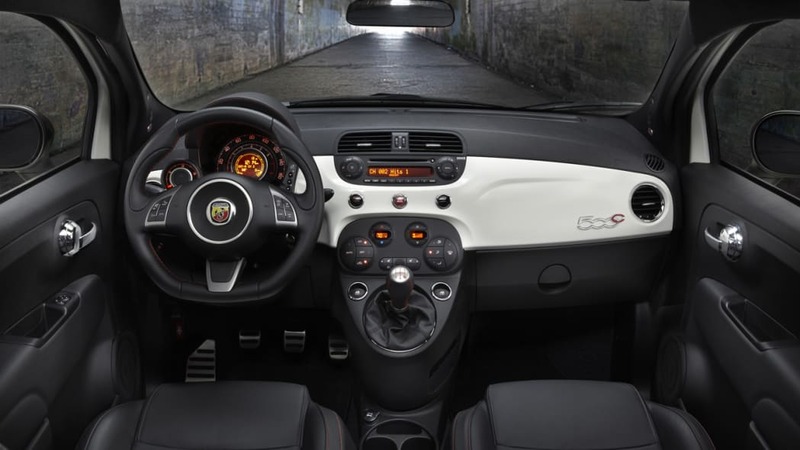 And with its direct integration into the Fiat 500 Abarth's interior system, the driver is able to use steering-wheel-mounted controls to make operation even easier. 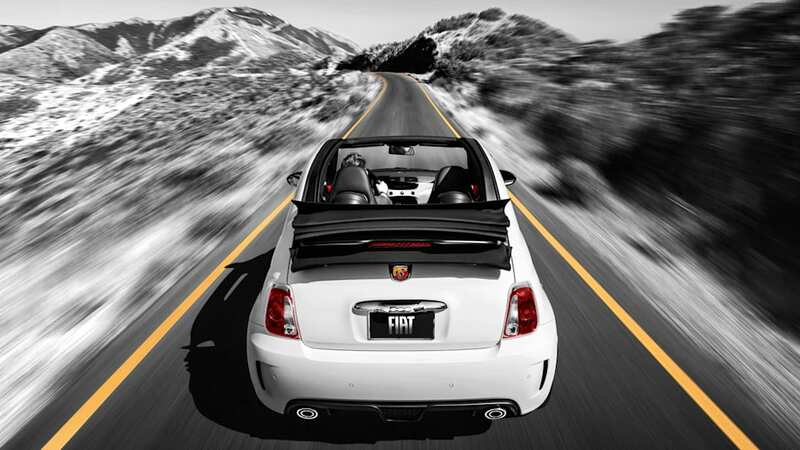 State-of-the-art connectivity and more than 35 safety and security features keep passengers of the 2013 Fiat 500c Abarth connected, comfortable and secure. The Fiat 500c Abarth features seven standard air bags, including driver and front-passenger advanced multistage air bags, driver's knee air bag, full-length side-curtain air bags and standard seat-mounted side pelvic-thorax air bags, all offering enhanced protection to all occupants in the event of a collision. In addition, the Fiat 500c Abarth features a unique three-mode electronic stability control (ESC) system standard for improved braking performance in wet or panic conditions. The Abarth-tuned ESC system features a three-mode calibration including "ESC On" to "ESC Partial Off" and enthusiast-desired "ESC Full Off." 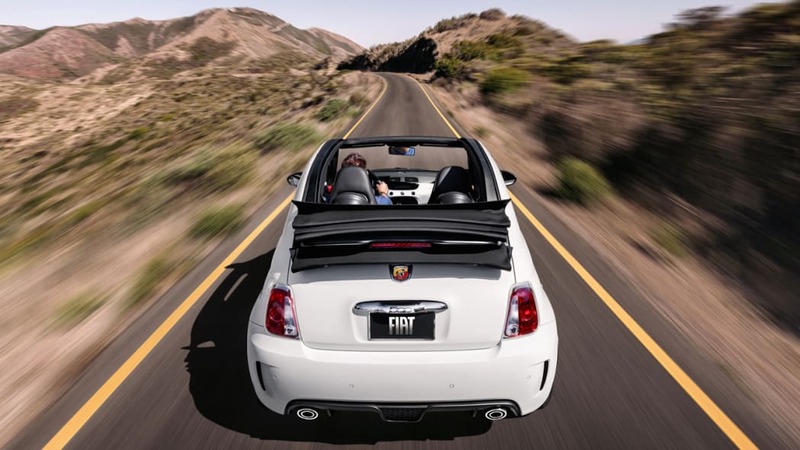 Included with each 2013 Fiat 500c Abarth is the opportunity for new owners to attend a segment-exclusive driving experience at no additional charge. The Abarth Driving Experience is an entire day of full-throttle training, guided by professional instructors from the Richard Petty Driving Experience to ensure fun and top-level instruction in a safe and structured setting.